Learn to become a certified nursing assistant qualified for the acute care, home care, and long-term care settings with this proven learning solution. 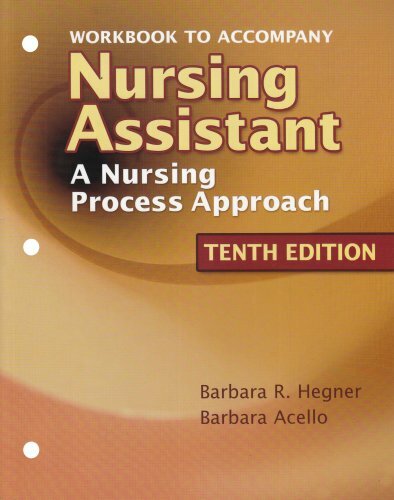 Nursing Assistant: A Nursing Process Approach is your competency-based resource for the latest trends and practices in nursing assistant education. With more than 160 procedures presented in a step-by-step format and over 1,000 photos and drawings to illustrate key skills, you will see why this book is the leader in nursing assistant education. subspecialties include resident safety, pain assessment and management, restraints, pressure ulcers, and infection control. She is committed to improving working conditions, education, and professionalism for personnel in the long-term care industry. Barbara Hegner, MS, RN Former Professor Emeritus Nursing and Life Science Long Beach City College, CA.